Good morning and happy Thursday to you. I hope the day is kicking off better for you than it did for me. I went to bed feeling pretty ill last night and woke up today, albeit feeling better than last night, with an achy head and a pretty sore throat. Seems there is something going around these parts lately. Blech. Now, time to celebrate. I have a special thing to celebrate this week. No, not a wedding anniversary. No, not a birthday. No, not of Best Body Fitness (although it has been almost a year since kicking this site off). Something completely different. So, what is there to celebrate? An anniversary of 3 years since I last had a full-fledged binge. Celebrate! And what better way to celebrate than with a blow up guitar and Elvis mask, no? Ahem. Three years. I can still remember it all. I had actually already spent the previous couple of years making progress with my binge eating habits through my pregnancy and early months with Makenzie. I had found a place of balance. Then, I went after my big goal at that time of doing a fitness competition. I’m still so glad I did that, but the diet definitely wasn’t safe for me and led to a lot of my previous struggles around food. I binged on occasion during my prep because of the restriction, but it was pretty few and far between. Then, when the show ended and I had that “freedom” again, I went a little crazy. Okay, a lot crazy. I spent an entire week (this week 3 years ago) eating to the extremes that I hadn’t seen in a couple of years. Every day of that week, eating way past discomfort and still not stopping. We’re talking full sized Halloween bags (yes, plural) of candy, dozens of doughnuts, boxes of cookies, and more that I can’t even remember. Then, still asking Peter to go out to dinner for pizza, burgers, etc at night (which we did). I think what broke my heart the most was knowing how far I had come and then feeling like I was going right back and losing all the fight I had given previously. That I couldn’t truly change and that there was simply NO hope. That it was just who I was. A binge eater. And I would have to live with hating myself for it forever. It feared me to see how easily it all came back – the hiding, the lying, the lack of control, the self loathing. That Sunday at church I found myself locked in a bathroom crying my eyes out wanting freedom from this. I find God’s sense of humor pretty amazing. Three years later the messages from my new church and pastor, Andy Stanley, leading up to this anniversary week covered the same sort of topic. And that the message still applies (click image to go to messages/podcasts/videos/etc). It’s STILL what helps me be free from binge eating. I won’t lie and say I have never struggled. Oh, I have struggled a lot over the past three years. I still have occasions where I emotionally eat – but not to the point of sick numbness that defined my binge eating. I still have occasions where I get down on myself. I still have to forgive myself for the occasional times I allow old triggers back into my life and the slippery slope I know they can lead to if I don’t remain aware. Those buggers will find any way to claw back in to a life. Despite that, I’m still free. I know I’m still free because I know that the binge eating was not, and IS NOT, me. It’s NOT ME. That change in mindset helped set me on a path to overcoming this immense battle back then and it keeps me enduring now and after every time I feel myself start to slip. I would say I’m pretty dang proud to have made it this far. I’m not, though. I’m humbled to have a God that loves me enough to have set me free to allow me to make it this far in His strength. I couldn’t have done it. I tried for years and couldn’t do it. Yet, I can still stand victorious today thanks to His grace. Today, I just want to celebrate that victory. It’s a victory you can have too…no matter what your struggle. Your Turn – What’s the last accomplishment you celebrated? *Note: I cannot, cannot, cannot, cannot express enough how powerful the message series I have linked above is. If you deal with ANY sort of struggle that holds you back in enjoying life, I highly encourage you to listen to the messages. Congrats, Tina! That’s a ginormous accomplishment! I’ve also struggled with binge eating, and I’ve experienced some success with taking away all of my food rules and just eating intuitively, but I DO struggle sometimes. Do you have any tips for what to do when you’re having one of those struggle moments? My biggest tips are determining triggers and doing what you can to avoid them or at least prepare for them in a positive way. Also, have ready ways to distract yourself when the urge starts creeping in so you can get away from those thoughts and/or food that would trigger you. Also, have someone you can call for support in those cases. Thanks for the tips, Tina! You remind me of a book I read about a year ago called Made to Crave by Lisa Terkeurst. Your reliance on God to see you through and set you free is really inspiring. You know what I also love? I LOVE that you celebrate this day and remember how far you’ve come. Happy Anniversary Tina!!! That is such a huge accomplishment. I can relate and your anniversary gives me motivation to stay on the right track. Such an accomplishment! Thank you so much for sharing, as a person who struggles with the same issues, I am greatful that you are willing to open up with such a personal post. While I am not glad that you have had to go through these troubles, it is nice to know that I am not alone with my battles (and I think I am less alone than what I think, but these issues are so seldom discussed). WAY TO GO, I am proud of you for both your accomplishment and your willingness to share such a personal part of your story. I determined a long time ago when I started blogging that I would be open about my story. I hated how alone I alwasy felt when going through it, so I wanted to be sure to open up so others would know they aren’t alone in it. In a weird way, I’m not sad that I had to go through those struggles if it serves a greater purpose. Thank you for saying in words what so many of us struggle with each and everyday. It may not be food but we all struggle with that urge to go over board with something. That type behavior does leave you feeling trapped and miserable. I am so glad you were able to overcome this. You’re strong, beautiful and helping others in by sharing your journey. yay, so happy for you Tina. It is a special day for you so proud of you! Well done; having suffered from years of binge eating/bulimia and anorexia myself I know exactly how it feels to make that achievement and the struggles that go along with it! Wow! What a timely post for me to read this morning after battling (and losing) this fight last night. I’m learning that it doesn’t have to be this way. It’s up to me to figure out how to deal with it and that has become my mission. Thank you for sharing this you darling gal! The biggest of Congratulations to you on your anniversary! Well done! Thanks, Jodi! And you can move forward and overcome as well. I wish you all the best! Very inspiring! I have struggled with self-esteem issues and eating disorders (anorexia & bulimia) which I think stems from a perfectionism…trying to achieve God’s love instead of just thankfully and gratefully accepting it. Grace is something I’ve really had to refocus onto (Unmerited Favor by Joseph Prince is a wonderful read on this btw). God has brought me through mine and continues to daily. Especially the mental battle, I’m always having to work on not being so critical of myself and learning to love “me” as God intended me to be-who knew it would be so hard! These battles and trials we go though just help strengthen our relationship with the Lord, and I wouldn’t trade any of them for the world. I love Andy Stanley, as well as his father! Cannot wait to listen to the sermon, hopefully I’ll make it to his church again one day and if so maybe I’ll see ya there. Definitely let me know if you come visit at North Point sometime! Thank you Tina for sharing your story here and being so open and honest about it. I’m so happy that you have been able to work through this and change your mindset. That feeling of going overboard and that sick numbness and of feeling trapped by that behavior is not a fun feeling at all. Congrats to you and many more anniversaries to come! this certainly is something to celebrate and be proud of every single day!! And what a victory it is my friend — you constantly amaze me with just how far you’ve come from that dark time in your life. There years binge-free is an incredible victory and I am so proud and so happy for you friend…I love how instrumental God has been in helping you to come out of that time in your life…and to see where you’re going now? Just beautiful. Congratulations my friend. xo! Thanks for the Andy Stanley rec! Are there any other Christian podcasts you recommend? I’m still getting into the podcasts thing myself, but do love me some Andy Stanley messages! So proud of you Tina! You ARE amazing. My eyes are literally filling up with tears reading your post! I am so so proud of you and am so thankful for you to be sharing this with your readers. We all have internal struggles and I personally have days that are hard for me, but seeing the changes God has made in your heart reminds me to trust him 100% in my life as well. Thank the Lord we have him to help us through hard times, or I would definitely be alone and lost! Thanks for linking that. 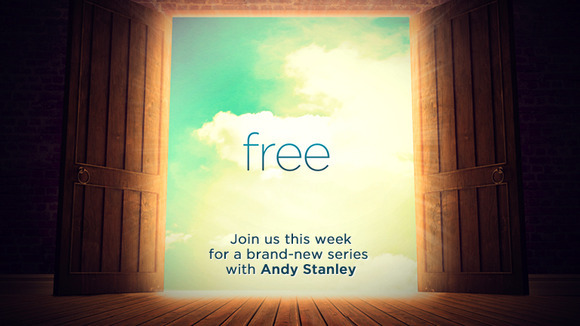 I know people just love Andy Stanley and I’m definitely going to listen to it. As you might remember, I really relate to everything you write about binging. Congratulations to you, Tina. I do not remember my last “major” binge — eating until the point of complete nausea, miserable and barely able to breathe on the the bathroom floor (yep…) — but I do NOT do it anymore. I just wrote an essay for a contest about my journey from ED to freedom through marathon running. It is an AWESOME feeling to know that it does not have control over me anymore. Like you said, it is NOT ME. Anyway, had to comment. Much love! This post made me smile. Congratulations! I can relate at how difficult that feeling of being “trapped” is and wondering if you’ll ever get out of it. Thank goodness it’s behind us now! Congratulations! Your story is continuously inspiring and to know that everyone struggles but manages to keep focus is a powerful message to share. Celebrate!! Congratulations, my inspiring friend you give so many women dealing with disordered eating, no matter what the form, so much hope! You’re such a fighter and I’m very proud of you. My last accomplishment (in relation to disordered eating) cannot be summed up in one moment…but I can sum it up and say that I have been doing a really good job lately of telling that mean voice in my head to shut up so I can show myself the kindness I deserve. That’s something I’m proud of. And sometimes that is what we have to do. Tell those thoughts forcefully to just SHUT UP! Congratulations to you, Tina. I love this message of thanks and this line is my favorite: I’m humbled to have a God that loves me enough to have set me free to allow me to make it this far in His strength. <- that right there? Is pure faith, and love for Him and all He does for us. You are living proof of that. I will check out this devotional series, it sounds incredibly uplifting and powerful. XOXO. Congrats to you Tina!! That is a huge accomplishment and one you should be sooo proud of!! The last thing I considered a big accomplishment is being financially secure! I grew up in a house which was not/ is not, and to know that I can pay my bills, saving money, paying off student loans, and able to pay for part of my wedding, is very liberating! Knowing that should my little sister in college need money for books or school, I would be able to help her, is the best feeling. That is so wonderful. And a big accomplishment itself. YAY Tina! You are such an inspiration! Aaaah 3 years is a long time! Way to go, girl!!! You should definitely be proud. Beautiful post Tina! As someone who used to struggle with binge eating this speaks volumes to me. You are such an amazing person, it is simply amazing to overcome. And I’m so proud of you for all that you’ve come through! I’m going to have to check out the link! I feel now how you felt then, like I am just a binge eater and that’s that. It’s good to hear you’ve made it three years but hard for me to see myself where you are! You have to listen to the messages. You just have to. With some tissues. You ARE NOT the force that pulls you to the binges and negative emotions and thoughts. You ARE HIS SPIRIT. HIS POWER. My heart breaks of you not seeing how wonderful and strong you are. I believe in you so much and you can always email me whenever you need. I’m so glad to have found such a good person and inspiration for the daily struggles of life and fitness. You have come so far and help me to remember that I can do it as well. Congratulations on your journey! You know how much this inspires me, Tina. I’ve made it a solid 100+ days now, and I look forward to the day that I can celebrate three years. What an AMAZING accomplishment! I know how hard those struggles are, that’s for sure. I feel so blessed to have you as a mentor/trainer/friend. And you will SO reach that point and more. Wow, Tina. Such an inspiring post. I’m so very proud of you for pushing through this struggle. A celebration indeed! Really proud of you. I know how hard it is and how tough you are! I think what not everyone realizes is just how long 3 years is in the world of food issues. It’s like a life time. I remember when I was first getting better being proud of 1 week and amazed by 1 month! You have so much to be proud of Tina and you are an inspiration!! This is such an inspiring post, Tina, and I’m so glad you shared it. Thank you for being so honest about your struggles and showing that no matter what issues a person struggles with, it IS possible to overcome them. We don’t have to be a slave to our the things that hurt us. Congratulations on such a wonderful anniversary! There is certainly hope, Elizabeth. You know where to find me if you need any support at any time. I love these posts from you Tina! You’re incredible inspiring to me and to so many! <3 you! just as someone said above, at the moment i’m finding it hard to imagine myself being someday in the place you are now and I think you are amazing! 3 years is a hell of a long time and I can only admire you. It’s been almost a year now since I discovered your blog and decided to change my life & get healthy. Where am I now? Well, considering binging was almost a weekly issue and definitely happened every single time I ate out, I don’t think I’m doing too bad but I still binged two weeks ago. I know it was just a blip on the road but still, it’s hard to not think that I’m back where I started! I’m also trying to get to grips with maintenance after loosing 10 pounds which isn’t helping either I guess. I don’t want to gain but at the same time I know that being binge free is more important to me than a couple of extra pounds. It’s all so overwhelming at times! Take pride in what you have accomplished and the strides you have taken. It’s about progress…not perfection. Keep moving forward and don’t dwell on the slip backs. They happen. Like I said, I still have had instances of emotional eating…just not a full binge. So I’m by no means doing things perfectly. But I still celebrate what has changed. Recognize what has changed for the better and see the strength in you from those and remembering that can keep you going forward. Hugs! Congratulations on fighting through something so powerfully strong in life. You’re so brave to go through that journey, and I’m proud of you! It’s a big accomplishment! The latest thing I accomplished was setting a 22 minute PR in my half marathon last weekend! Congratulations on overcoming something that used to have such a strong power over you. I think we can all relate to struggling with various things whether that be food, self loathing, etc. I so appreciate you sharing your message and your journey. The blessed thing is that He is always there with us, every step of the way, no matter what slip ups or ups & downs we go through. I can’t wait to listen to the message series from your pastor. Thanks for sharing! I am so glad I saw this post today. I recently lost a lot of weight and once I hit my goal, I began a binge-restrict pattern that I am working my way out of now. It gets ugly sometimes, but I have taken control and am working on finding my balance. I really do relate to your story on so many levels. Happy anniversary!!!! That is truly such a huge accomplishment… because of it I am sure you are a better mom, wife and friend because you aren’t constantly being drained of a very time consuming habit! You are such an inspiration to so many people who struggle with binge eating. I struggled with it for 3.5 years and it has been about a month since my last binge. Life really is so much better without that awful habit! Tina, I love ya. I always, ALWAYS appreciate your honesty and how beautifully you express everything. I feel like you’re talking right to ME every time. I think that if you ever have issues with food and your body, they never 100% go away- but getting them to a place that you can manage is a remarkable thing. You should definitely celebrate and be proud of how far you have come- and that you have such a healthy lifestyle now, and are such a great healthy role model to those two beautiful children. Wow. Big congrats! That’s one serious milestone. You are a strong lady! Can’t say how THANKFUL I am for YOU for sharing this journey with us and for the ministry series recommendation. I cannot wait to cuddle up in my bed tonight, laptop on my lap and watch them. Thank you for sharing your story Tina, you ROCK!!! You are an inspiration for so many people. PS I am loving Best Body Bootcamp!!! a very open post… everyday can be a struggle. whether it is with eating, working out, drinking, anything and everything out there can be a temptation. continue to use your inner strength, combined with strength and inspiration/motivation from others. Keep doing your thing. You are FREE and amazing. You are so, so strong. This day is all yours and I’m so proud to read a story like this! You’re an amazing woman, that’s for sure! i usually play one of andy’s messages while i do your boot camp weight workouts! it has been a huge blessing to have workouts i am able to complete in my makeshift home gym while watching his sermons. my parents attend northpoint and i love visiting when i am home…. the online version is pretty awesome though here in texas! How cool that you do that. And a great idea! I just started going to North Point this summer so keep meaning to go back and listen to old series on podcasts. Wow, Tina, this is an AMAZING accomplishment! I am very proud and you lead by a wonderful example to me and many others. Congratulations on your accomplishment! Congrats Tina! And thank you for always being so open & honest about your struggles. I think many people would see you & assume you are fit & healthy, having never struggled with weight or self acceptance. Also, you inspire me to keep working and bettering myself physically, mentally & spiritually. Again, thank you for being so open about this process. So happy to see you thriving! It is only through His grace that I can achieve anything. In the last 3 years I have overcome bouts of depression and anger that leave me feeling similar to what you described. I just cry out to the Lord asking to be Free from what traps me and in Him I am free. My most recent accomplishment (2 days ago) was giving birth to my beautiful baby girl! I want her to know what freedom in Christ feels like and never to feel low or down about herself. It is already making me a stronger woman! Tina this is amazing!! Happy Anniversary! Thank you so so much from writing this. I have hesitated talking about my binge eating problem on my blog more than anything because I am ashamed of it. I think I need a little more time before I can be explicit about my problem on my blog (it’s only been about 6 weeks since my last binge), but I have SO much hope for the future. Thanks to posts like this I have the courage and hope to continue on into recovery! What an AWESOME anniversary to celebrate! AWESOME Tina! I am so proud of you for overcoming that! You are a great role model to girls that do struggle out there! Thanks for sharing. This helps give me hope that I can get there too. I just read your entire series on binge eating. It made me realize that I used to binge eat quite a lot. Hmmmm, like every day. Sneaking food when people weren’t looking or weren’t home. Planning when I could eat a ton. Waiting till my husband got in the shower and scarfing food down so he wouldn’t know. I never classified it as binge eating, just thought it’s what fat girls do. I couldn’t say the last time I’ve binged but it’s been years now. I’ve lost 80 pounds on weightwatchers to reach goal and I’ve kept it off for the most part- just a few pounds here and there I bounce between. But still at a healthy weight. I try to eat intuitively, so perhaps that helps me with binge eating. You really are NOT alone at all. And it is certainly not YOU doing these things. It’s a disorder and mental struggle…not a lack of willpower or something wrong with who you are. It took me a long time to accept that and it was so freeing. Congrats on all the progress you have made and here’s to many more years binge free. I’m reading back through your binge eating posts to find encouragement and see hope in this battle I’m fighting! I love the end of this post where you wrote that God has set you free by His great love and grace! I needed that reminder that Christ wants me to be free and is fighting along side me. It’s so great to read a blog that recognizes that God is in control!